The village of Bulcote Nottinghamshire was well established by the time of the Norman Conquest in 1066. In 1086 the scribes of the Domesday Book recorded the taxable assets of the village and identified Walter D’aincourt a Norman knight as the Lord of the Manor. Walter did not reside in the village; he rented the land to the De Busli family. At this time the village did not have either a priest or a church. 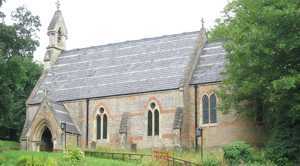 It is assumed that then, as now, the religious needs of the villagers was the responsibility of neighbouring Saint Helen’s Church Burton Joyce. Records show that the site for the first church was given by Adam Sancta Maria in the early part of the 13th Century, initially as a burial ground and Chapel of Ease for the repose of his wife Alice. He later gave the advowson of the church to the Abbot of Welbeck Abbey. This was later transferred to the Augustinian Priors of Shelford and then, following the dissolution of that order, was acquired by the Stanhope family. The records of the Archdeacons’ Courts throughout the 17th and 18th Centuries make it clear that the church was known as Holy Trinity and regularly in need of repair. In 1861 the near derelict building collapsed after being struck by lightening. Colonel Egerton-Leigh of High Leigh in Cheshire was at this time the Lord of the Manor, but again not a local resident. He did however fund the £900 cost of building the new church that we see today. The architect of the new church, opened in 1862, is not known. The church is set on a hillside overlooking the village and the A612 Nottingham to Southwell Road. It is mainly constructed of local stone separated by multiple courses of red bricks. The stone window frames are of Lincolnshire limestone, as is the ornate belcote housing the single bell set over the west gable. The chancel is apsidal, and the roofs are covered in slate. Burial grounds are located on the West, South and North side of the church and are still in use. Stained glass is restricted to the chancel windows, the nave windows being filled with plain leaded glass. Internally there is a central aisle with wooden pews on each side. All of the liturgical fittings occupy their traditional locations, with a pair of Scripture Boards dated 1875 hung one on either side of the chancel arch. Each of the four stone corbels supporting the short columns on either side of the chancel arch has the carved head and face of one of the four evangelists. The church is in regular use with only a recent small extension cutting through the west wall built to provide modern facilities for users distinguishing the structure from the building opened in 1862.